Note to editors: There are three maps associated with this press release. 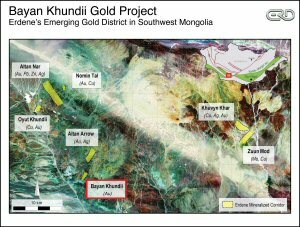 Erdene Resource Development Corp. (TSX:ERD) ("Erdene" or "Company"), is pleased to announce additional results from follow-up drilling on the recent high-grade discovery at the Company's 100%-owned Bayan Khundii Gold Project ("Bayan Khundii") in southwest Mongolia. Today's results are for the second batch of drill results (9 holes; 835 metres) from the Company's on-going Q2-2016 drill program that now includes an expanded 30 diamond drill holes totaling 3,825 m. Included with this release, for reference, are two plan maps and a cross-section. 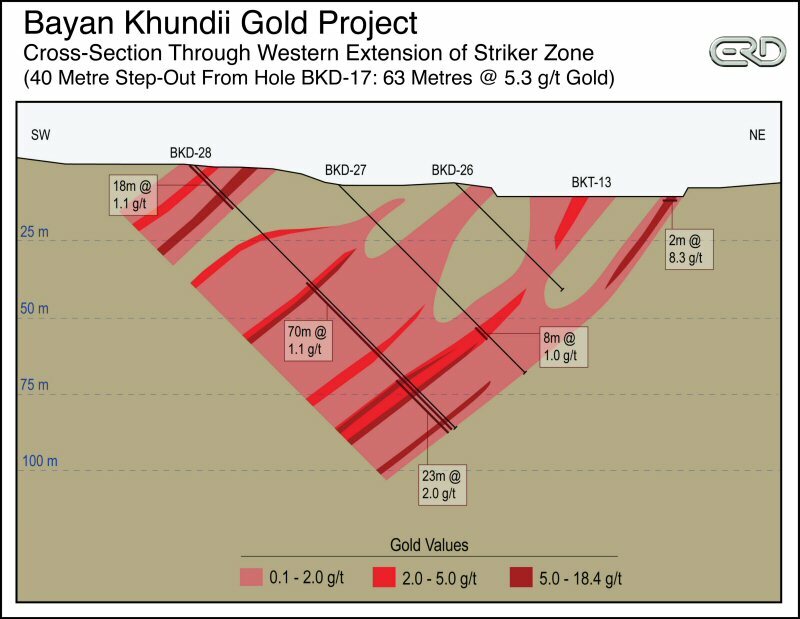 "The Bayan Khundii exploration program continues to return impressive intersections of gold mineralization often coming to surface and that appear to extend below the current depth of drilling. These initial drill results provide continuity of mineralization in the Striker Zone, one of several targets now being explored over a 1.7 km strike length," said Peter Akerley, Erdene's President and CEO. "As we begin to test the boundaries of the main mineralized area, it is apparent that intense alteration associated with the gold mineralization is extensive and continues under surrounding younger volcanics. We are currently well financed to continue with a very active field season of drilling as a result of the recent Sandstorm Gold financing and the exercise of warrants." (i) Reported intervals are not true width. They represent drill intersection widths from holes drilled at 45 or 60 degree angles. The mineralization at Bayan Khundii is interpreted to be moderately dipping (approximately 40 to 50 degrees to the southwest), approximately perpendicular to drill hole angles. * Reported intervals are not true width. They represent drill intersection widths from holes drilled at a 45 to 60 degree angle. The Bayan Khundii mineralization is interpreted to be moderately dipping (approximately 40 to 50 degrees) perpendicular to the drill hole angle. With the success to date of the Q2-2016 Bayan Khundii exploration, the program has been expanded from 3,500 m to 3,825 m of diamond drilling in 30 drill holes. The 2016 drilling program was designed to test both the continuity and extent of mineralization in the main zones, including the Striker Zone, and to explore the possible limits of mineralization through reconnaissance drilling. This program will be followed by more detailed drilling in Q3-2016. The drill results are being released in several stages; the first batch of results (7 holes; 1,012 m) were released on May 9, 2016; the second batch (9 holes; 835 m) are being released today; and the final results (approximately 14 holes; 1,978 m) are anticipated to be released in late Q2-2016. Initial drill results and program details are included in the May 9, 2016 release (click here for press release). Partial results for the 2016 trenching program have also been received. Based on the drilling and surface sampling completed to date, when all zones grading greater than 1 g/t gold are excluded, the entire target area has a pervasive low-grade gold mineralization averaging greater than 0.1 g/t gold. Bayan Khundii is a low sulfidation epithermal gold system with all of the primary lithologies (volcanic tuff and andesite) pervasively altered by multi-stage, locally intense, silica and sericite alteration. The locally intense silica-sericite alteration (SS2) overprints the pervasive silica sericite alteration (SS1) and commonly forms selvages (halos) around quartz veins, fractures, and hematite/specularite veinlets, as well as selvages surrounding disseminated hematite and other inclusions. Extensive hypogene hematite and specularite mineralization occurs as veinlets, mineralized fractures, locally disseminated, and infilling of breccia zones, including common hematite-quartz breccias. Quartz veins and breccias occur within all altered lithologies and include comb textured quartz, saccharoidal (sugary) quartz, recrystallized quartz (intensely silica altered) as well as chalcedonic quartz. The gold mineralization is associated with quartz veins, quartz breccias, within hematite-specularite veins and fractures, within altered host rocks including along margins (alteration selvages) of quartz veins and disseminated within the altered host rocks, often, but not always, associated with disseminated hematite-specularite mineralization. Gold grades within the host rocks, excluding the greater than 1 g/t material, average 0.1 to 0.2 g/t gold. The recent drilling supports much wider zones of gold mineralization than previously recognized, including previously untested gold mineralization west of the Striker Zone with 70 m of 1.1 g/t gold in hole BKD-28. Gold mineralization is generally observed to be fine grained. 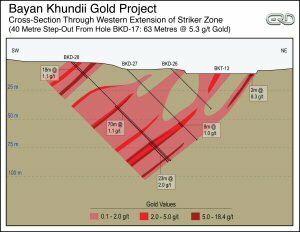 Initial independent metallurgical test work, completed by Erdene in February 2016, indicates the gold mineralization at Bayan Khundii is very amenable to conventional processing techniques involving a combination of gravity and cyanide leach of gravity tails, yielding 99% gold recovery for the high-grade composite sample (24.9 g/t gold) and 92% gold recovery for the low-grade composite sample (0.7 g/t gold). Blue Coast Research Ltd. of Parksville, British Columbia, carried out the metallurgical testing program, the details of which can be found in Erdene's February 16, 2016 news release (click here for link). The current drill program includes continued testing of Westridge, Stockwork and Striker Zone extensions to the north. It is anticipated that this phase of the Bayan Khundii exploration program will be completed in June 2016 with all results received by the end of Q2 or early Q3. On completion of the drill program, the Erdene technical team will be interpreting all results and establishing plans for the next phase of exploration with a follow-up drill program anticipated in Q3-2016. In Q2-2015, Erdene conducted an initial exploration program on the southern portion of the Company's 100%-owned Khundii license. This reconnaissance work led to the discovery of the Bayan Khundii ('Rich Valley') gold prospect, located 20 km southeast of the Company's flagship Altan Nar gold-polymetallic project. 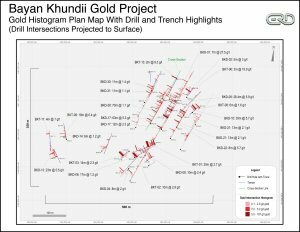 Subsequently, gold mineralization at Bayan Khundii has been identified in three separate prospect areas over a 1.7 km trend, with detailed exploration only taking place over a 500 m by 350 m zone in the southwest prospect area, where the Company's Q4-2015 and Q2-2016 drill programs have focused. Visible gold has been observed in multiple drill holes and results include several high-grade intersections within a series of parallel structures exposed at surface. 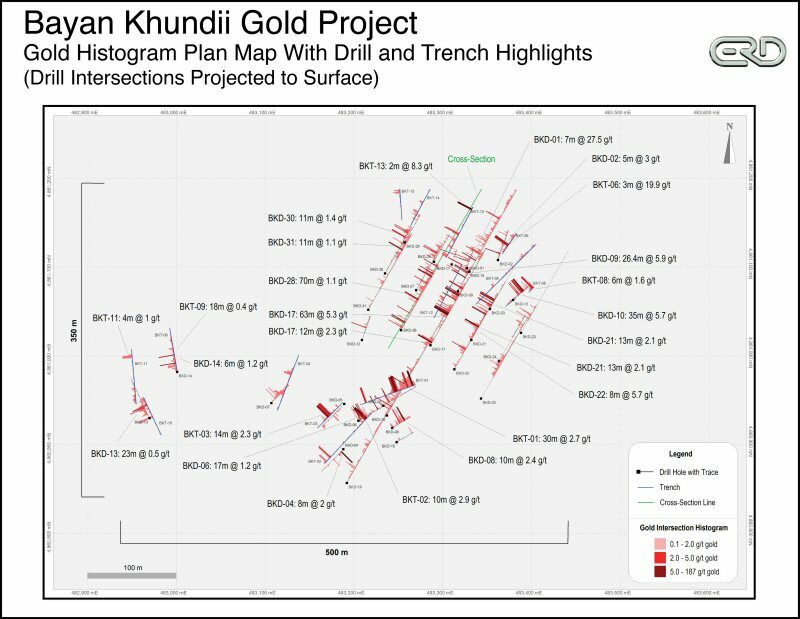 Results include up to 35 m of 5.9 g/t gold in hole BKD-10 (including 12 m of 16.2 g/t gold) from surface to the bottom of the hole, and 63 m of 5.3 g/t gold in hole BKD-17 from 50 to 113 m depth. The details of the Q2-2015 drill program can be found in Erdene's December 14, 2015 news release (click here for link) and details of the first phase of results from the Q2-2016 drill program can be found in Erdene's May 9, 2016 news release (click here for link). The license has a 2% net smelter returns royalty ("NSR Royalty") in favour of Sandstorm Gold with a buy-back option to reduce the NSR Royalty to 1%. Erdene's sampling protocol for drill core consisted of collection of samples over 1 m or 2 m intervals (depending on the lithology and style of mineralization) over the entire length of the drill hole, excluding minor post-mineral lithologies and un-mineralized granitoids. Sample intervals were based on meterage, not geological controls or mineralization. All drill core was cut in half with a diamond saw, with half of the core placed in sample bags and the remaining half securely retained in core boxes at the Company's Bayan Khundii exploration camp. All samples were organized into batches of 20 samples including two commercially prepared standards and blanks. Sample batches were periodically shipped directly to SGS in Ulaanbaatar via Erdene's logistical contractor, Monrud Co. Ltd.
Erdene Resource Development Corp. is a Canada-based resource company focused on the acquisition, exploration, and development of base and precious metals in underexplored and highly prospective Mongolia. The Company holds four exploration licenses and a mining license in southwest Mongolia. These include: Altan Nar - an extensive, high-grade, near-surface, gold-polymetallic project that the Company is advancing toward a production decision, however the Company has not yet completed a mining study to support the technical feasibility and economic viability of Altan Nar; Bayan Khundii - an earlier-stage, high-grade gold discovery made in Q2-2015; Khuvyn Khar - an early-stage, copper-silver porphyry project with multiple drill targets and significant copper intersections; Zuun Mod - a large molybdenum-copper porphyry deposit; and Altan Arrow - an early-stage, high-grade, gold-silver project. In addition to the above properties, the Company has an Alliance with Teck Resources Limited on regional, copper-gold exploration in the prospective Trans Altay region of southwest Mongolia. For further information on the Company, please visit www.erdene.com. Erdene has 119,753,765 issued and outstanding common shares and a fully diluted position of 131,384,791 common shares.